You have a beautiful and fine whittler there, Lloyd. Can't be too many of those around. Duffer wrote: Here is a J. Russell & Co. GRW 3.375" split back Whittler pattern EE Pearl folder. knife7knut, found the web site on the museum--very interesting! They have a good "write up" on the John Russell Mfg. Co.
That whittler is drop dead gorgeous! Thanks for posting it! Thanks Joe and knife7knut for the kind comments!! Bringing this back to the top - A few months back I finally found a fish knife that tripped my trigger as I have been waiting for the right one to come along... This old Green River Works knife has a sweet checkered cocobolo handle and has an Abercrombie & Fitch etch along with Russell Green River Works. A&F was a high end retailer of fly fishing and fishing equipment starting in the late 1800s unlike major retailers who are here today. As an example their old bamboo rods were made by some of the more well known and quality builders of the day including Edwards. From a collectibility standpoint for old fishing equipment it is a desirable find. Interestingly the knife came with a Russell sheath that I have seen with Russell Hunters. 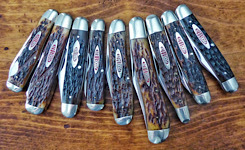 Gunsil (Gene) had told me that Russell fish knives did not come with sheaths but it is possible and I am speculating that given A&F was a high end retailer perhaps they had these specific knives ordered with a sheath from Russell. I have to say the sheath fits perfectly on this knife. Nonetheless I can finally check that knife off my list though I would really like a fly fishing knife like a Case but would prefer an old Sheffield fly fishing folder ... thanks for looking! That is a real old time beauty, Lee. Nice thread with some beautiful knives. I just bought a J. Russell Green River Works kitchen knife today for a $1.00. Its a little different than the ones on the previous page with only 2 pins per scale and the handle is a bit more rounded. The tang is tapered and the scales are smooth bone. CASE made a very similar fishing knife to the one above. I have one with wood handle and one with green bone. The green bone actually is carried in my pack. I don't collect Russell knives, but I do collect Cattle knives which is how I ended up with this JRussell & Co Green River Works 3 5/8" ebony handled Cattle knife. It's a shame they sell grinders to people who don't know what to use them for (see sheepfoot blade). Otherwise this is a very fine example. Here's one I let swim away. I was approached by a dealer to authenticate a Russell farmers jack a few years back. I know little about Russells per say, but I've seen a few farmers jacks. My opinion was it just didn't look right,kinda clunky for a golden age knife. It reminds me of the Japanese Parkers. I may be way off ,but when a knife doesn't look right,I stop chewing and spit it out. I hope Dimitri and Wayne take a look. Thanks to all who replied to this post. That A&F fishing knife is almost identical to one I have stamped Lamson & Goodnow who are part of the Dexter-Harrington Co. that purchased the John Russell Co. years ago. I also have a John Russell Green River Works sticker that I believe was a re-issue in the 1970's.The etch looks too modern to be an original 1870's knife. Speaking of Abercrombie & Fitch(the outfitters;not the clothing idiots)I have an old Joseph Rodgers folder that has checkered horn handles;a built-in scale and other fishing related blades that was made for them. Also I have a John Russell thistle handled knife that was made for Iver Johnson Sporting Goods of Boston(another outfitter that also made firearms). That farmer's jack would have probably thrown me for a loop as well.Although it looks good at first glance and could probably be authentic the bar shield and fluted bolsters would have raised red flags with me.I've never seen any Russells with either of those features. That cattle knife is still a beautiful knife and I agree there should be a law against "incompetent use of a grinder"
Ray - lots of nice knives ... But that Rodgers Fishing Knife is awesome - that is just exactly what I would be looking for to add to the pile someday That kind of knife brings together my two halves Is that checkered gutta percha handles on the Rodgers? Lee, really like that fish knife, I find the large checkered handles very interesting. I have a Russell pruner that has checkered ebony handles with the same large diamonds. Thanks for the kind words. The handles appear to be checkered horn.Usually if you rub gutta percha briskly with a dry cloth you will get a distinct odor and this is not the case with this knife. I got this knife from a friend of mine many years ago and have yet to see another one like it.